Greek art collector, businessman and philanthropist Dakis Joannou needs no introduction. His name has been on the ArtReview Power 100 list of the art world’s most influential people every year since its inception (last year Joannou came in at #43). When interviewed by Arterritory.com last year and asked about his relationship to collecting art, he stated, “Actually, it’s a story about understanding, artists and the desire to be as close as possible to the source of creation.” Joannou is also one of the most active supporters of Athens’ and Greece’s art scenes, and as such he has achieved things that even many of Europe’s most influential cultural organisations are not able to do. For example, for many years now, he’s brought together in one place the lion’s share of the art world’s crème de la crème. These people – ranging from Massimiliano Gioni, Urs Fischer and Jeffrey Deitch to Maurizio Cattelan, well-known gallery owners, curators and other people linked to art – meet for several days shortly before Art Basel, the world’s most prestigious art fair, for the DESTE contemporary art foundation’s annual summer programme. 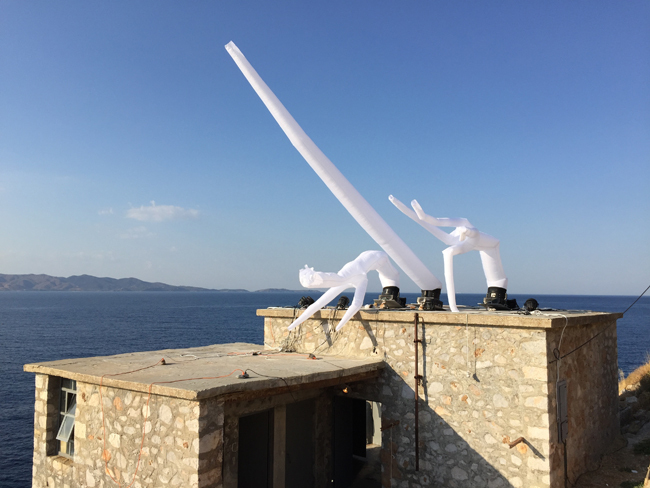 With four exhibitions in Athens and one an hour-and-a-half away on Hydra Island, the scope is grandiose enough for Athens to be included on a current list of summer art destinations. One of the cornerstones of this year’s DESTE programme is the Ametria exhibition (138 Pireos St., until October 11), which is the result of its cooperation with the Benaki Museum. 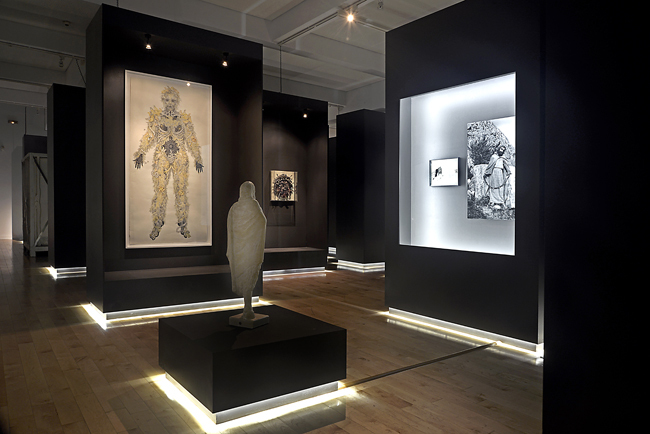 The exhibition is located in the museum’s new home, which opened in 2004, the same year Athens hosted the Olympic Games. The new space, constructed in the 1960s, originally housed an automobile factory. The name of the exhibition is derived from the Greek word “ametros”, which are anomalies of the refractive state of the eye that result in a number of vision problems. The exhibition serves as a sort of reminder of how beneficial it sometimes is to look at the world from outside our regular frames of perception. The Ametria exhibition is set up like a maze with a conditional beginning and end, but it has no definite direction of movement. It allows the visitor to wander and lose his/her way, now and again seemingly returning to the same spot, yet each time unexpectedly noticing something new. The exhibition begins as a journey into the forgotten ancient history of the city, with old maps of Athens and the ambitious ideas of centuries of city planners and mapmakers serving as a unifying element. Yet even that is only an illusion, as the next bend in the maze serves up new visions of imagination/art that seem to have nothing in common with the previous elements. The works of art are not marked in the traditional manner, with the artist’s name and the artwork’s date – such information can only be learned with the help of the map, an action that distances the viewer from any predictability of thought or sensation. The map itself is just as disorienting as the maze. One the one hand, the map turns visitors into children, searching for the route a mouse must take through a maze to escape from the cat...or into tourists trying to find their location by poring over a map of a maze of streets. And suddenly – with genuine joy – they find an Eiffel Tower, or one of those well-known pieces of art created by an artist everybody knows. 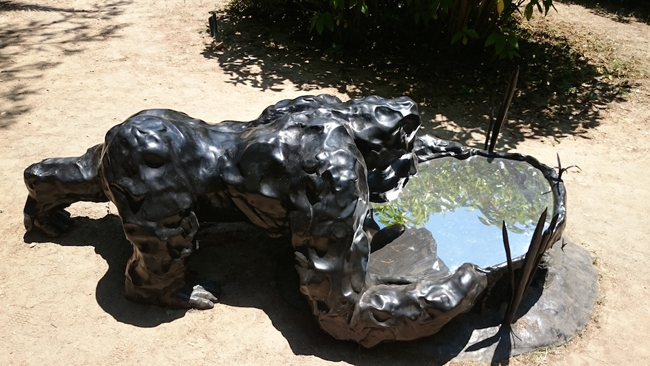 For example, as you wander through the maze, you happen upon Urs Fischer’s Skinny Afternoon, in which, having propped its bony breastplate on a grey concrete vanity and standing with one leg slightly bent in a model-like pose, the skeleton of the “eternal Narcissus” gazes at its reflection and in his self-love has not noticed the passage of time. 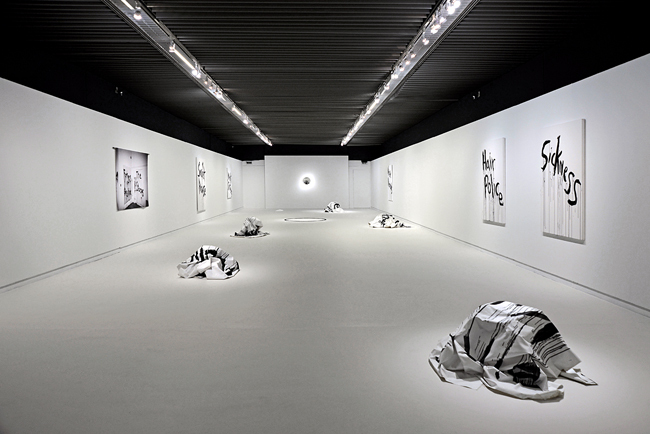 Italian artist Roberto Cuoghi, whose creative work has always focussed on the idea of continuous transformation and changes, designed the Ametria exhibition concept. One of Cuoghi’s most legendary works of art is a performance that lasted several years and overtook the natural pace of time. More specifically, beginning in 1998, when the artist was 25 years old, he decided to embody his father’s character. He gained weight, he grew a long beard, and he began dressing and behaving like his father, thereby almost physically destroying the boundary between reality and fiction. This performance, however, cost the artist dearly; when, after his father’s death, Cuoghi decided to return to the normal pace of his lifetime, the process turned out to be slow and painful, even requiring surgical intervention. 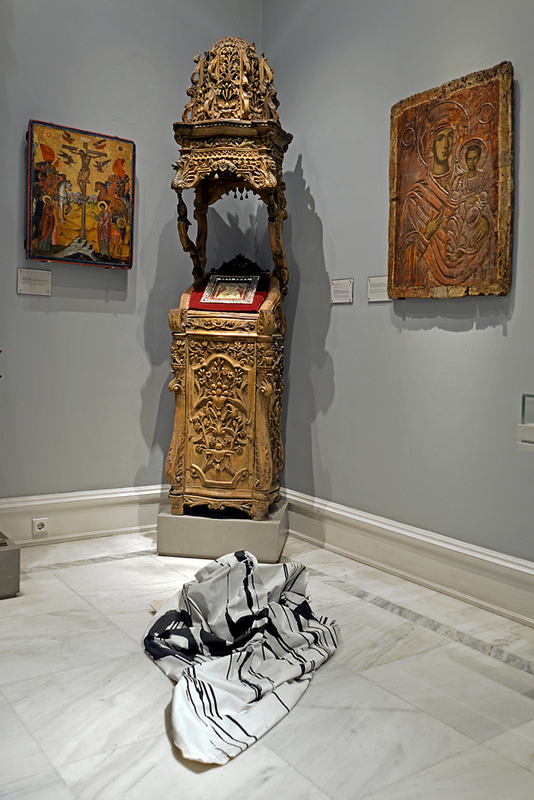 In total, the Ametria exhibition features more than 150 works of art and artefacts from the DESTE Foundation as well as the Benaki Museum’s collections. 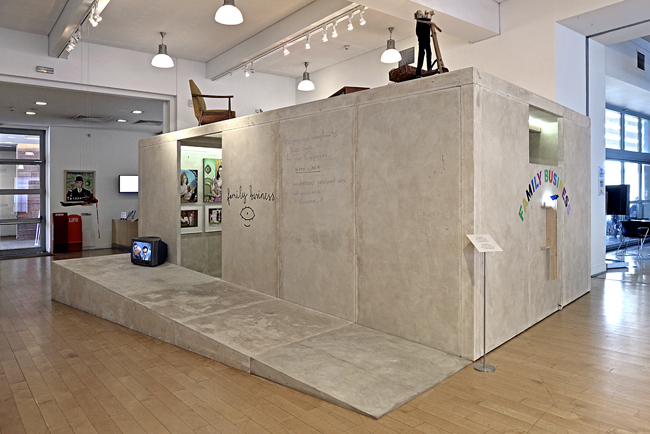 On the first floor of the Benaki Museum – between the cash registers, café and museum shop so ubiquitous of contemporary art spaces – artist Maurizio Cattelan and Massimiliano Gioni (the artistic director of New York’s New Museum) have constructed a “slumdog millionaire” abode of plywood for Family Business, their 2012 initiative in New York. Now the space is devoted to the Dirty Linen exhibition, an ironic and sometimes sorrow-laden story of the family as an institution in today’s society and, in a way, a mirror and stage for its daily soap operas, scandals, happy moments and taboos. 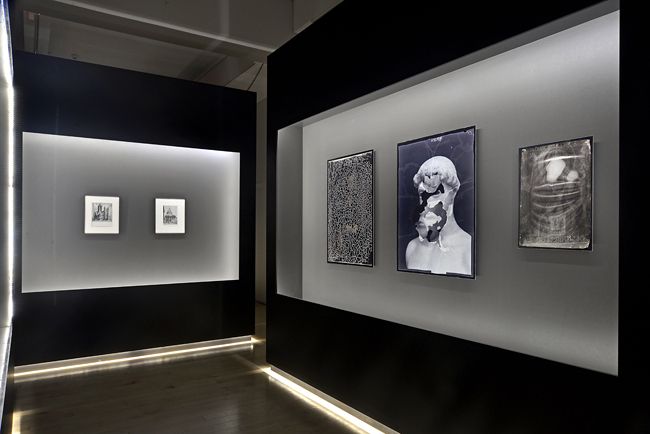 The exhibition resembles a large family photo album in which fiction, truth and rumour, sentiment, passion and hate, open exhibitionism and quiet shyness are all intertwined in one big tangled ball of yarn. The Benaki Museum Cultural Centre is already the third home of Family Business, which began as an alternative, non-profit art space for experimental and innovative expression of art and forms of cooperation. It was originally located in the entryway of an undistinguished store in Chelsea, where it hosted countless exhibition projects from 2012 to 2014. In February 2014 it moved to Palais de Tokyo in Paris, where its architecture resembled a crooked little hut you might find on the outskirts of Athens. 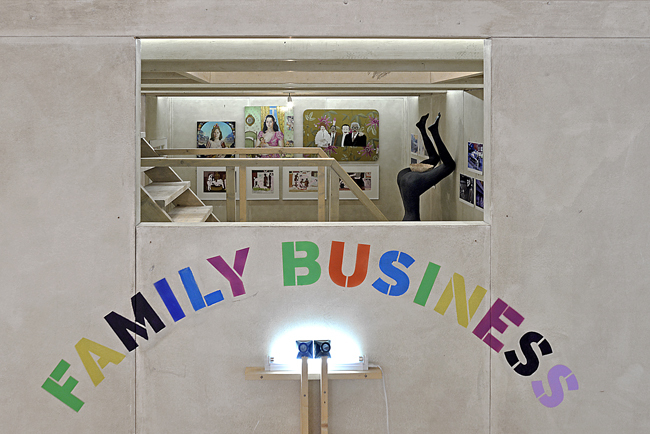 It is hoped that Family Business will host a number of exhibitions in Athens and serve as an experimental platform for those who have something unusual to say and offer. The DESTE Foundation, the Benaki Museum and Family Business will select exhibition participants through open-call programmes. Until August 30, the Benaki Museum’s main building, which is also one of the most beautiful Neoclassicism-style buildings in Athens and also the first private museum in Greece (Antonis Benakis [1873-1954], the descendant of a prestigious Greek family living in Alexandria, Egypt, opened the museum in 1930 in a former family property), is showing American musician and artist Kim Gordon’s exhibition Design Office: Noise Name Paintings and Sculptures of Rock Bands That Are Broken Up, a dedication to the so-called noise music genre. The Museum of Cycladic Art, one of Athens’ most special museums, focusses on the ancient cultures of the Aegean and Cyprus. 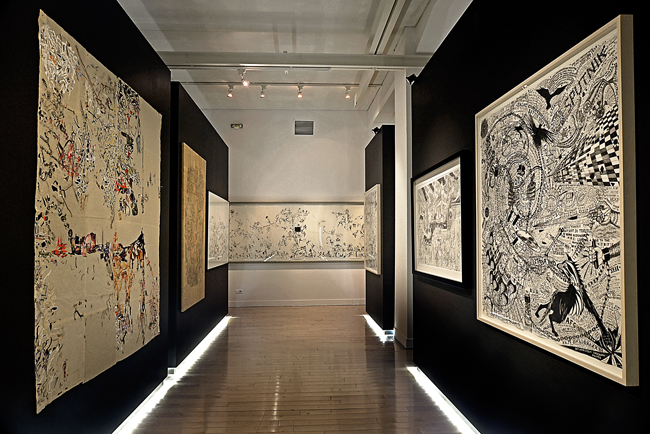 It was founded in 1986 to house the impressive private collection of Nicholas and Dolly Goulandris, and since 2009 it has also become the permanent home of the DESTE Prize exhibition (4 Neophytou Douka St.). See the 2015 Prize exhibition until September 30 of this year. The DESTE Prize was established in 1999 with the goal of supporting contemporary art in Greece, and it is awarded every other year to a Greek artist living in Greece or abroad. This year’s exhibition features the works of six nominees, and the award ceremony will take place on September 7. An international jury will select the winner, who will take home 10,000 euros in prize money. 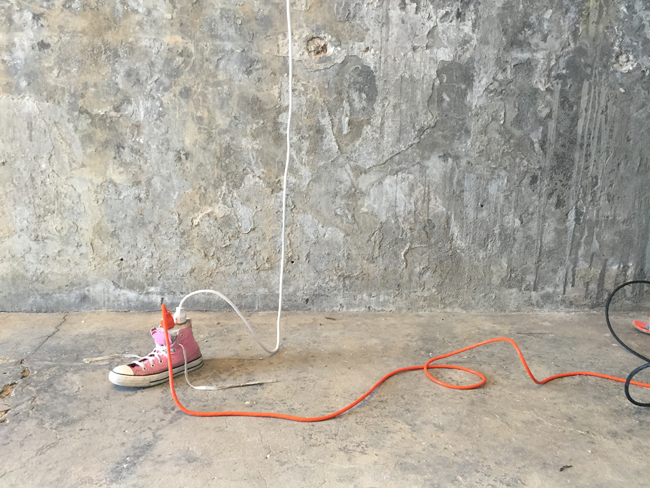 One of the nominees, Angelo Plessas, has an installation in the exhibition titled Eternal Internet Brother/Sisterhood, which he began in 2012 by inviting all of his Internet “friends” – artists, poets, architects and other creative types – to take part in a camp/happening lasting several days on the island of Anafi. There they conducted a new model of social life and, at the same time, looked at the hypermobility and hyperconnectivity of the technological era from a different viewpoint. Eternal Internet Brother/Sisterhood projects have also taken place in Mexico and by the Dead Sea in Palestine, and, according to the artist himself, whom we met next to his “survival tent”, more such events are planned. Cyprus-born artist Socratis Socratous, for his part, is represented at the DESTE Prize 2015 exhibition with an existentially sorrowful and at once very beautiful work of art, which is particularly poignant at the current moment, when Greece is experiencing an economic crisis that is undeniably being felt throughout the city. 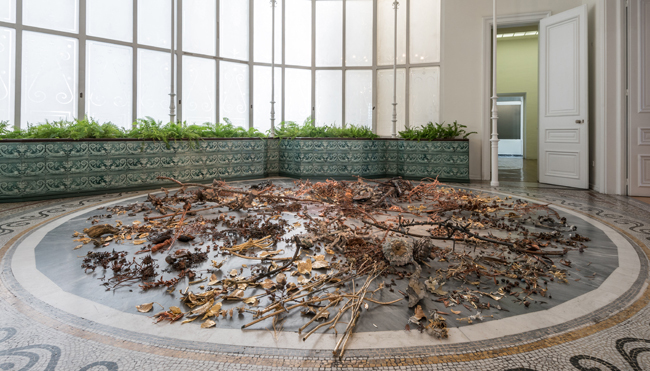 At the nearby Athens National Garden, Socratous gathered naturally “fallen” objects – pine cones, windfallen tree branches, last autumn’s leaves – and then cast them in bronze, as if creating artefacts of a lost era now displayed on the ornate tile floors of the Cycladic Museum. As long as you’re in Athens, the nearby island of Hydra is worth a visit. There, in a former slaughterhouse, DESTE opened its DESTE Project Space Slaughterhouse branch in 2009. 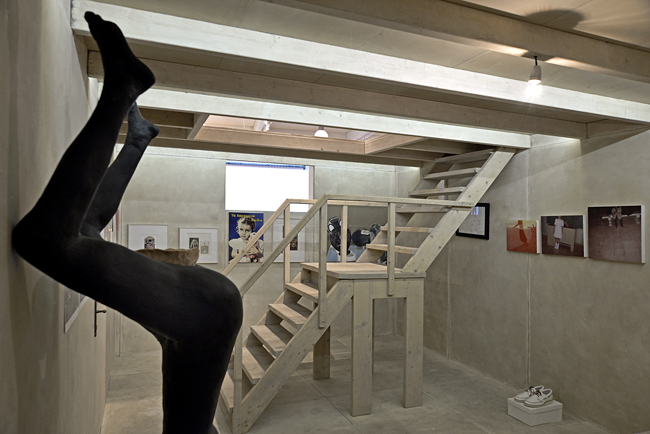 Each year, the space is devoted to one artist or artists’ group, who then specially creates a project for the space. Urs Fischer, Matthew Barney, Maurizio Cattelan, Doug Aitken and Paweł Althamer have all been among these select artists, while this year the space is focussing on American artist Paul Chan, who won the Hugo Boss Prize in 2014. 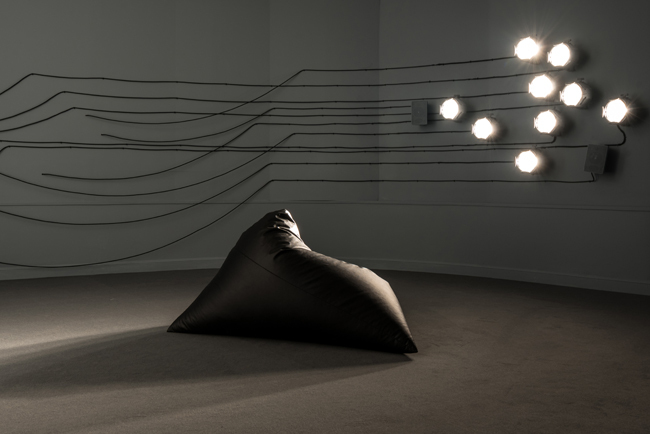 Chan’s project, Hippias Minor (on display until September 30), was inspired by a dialogue of the same name by the Ancient Greek philosopher Plato. The dialogue, one of Plato’s early works, centres on Socrates’ contradictory arguments about there being no difference between a person who tells the truth and a person who lies. Chan’s work consists of two parts – one is an installation on the roof of the former slaughterhouse, while the other is a new translation of Plato’s work by American poet, translator and essayist Sarah Ruden, co-published by the DESTE Foundation and Chan’s own publishing company, Badlands Unlimited. The opening event for the project took place under a giant grape vine at a local tavern, where Chan – in the best tradition of the Ancient Greeks – had organised a Hippias Minor symposium for the DESTE guests, thereby reviving the ancient tradition of debate, which at times morphed into an intellectual cross-examination. Hydra, which is called one of Greece’s most romantic islands, has long been a favourite holiday site for Greek aristocrats. There are no automobiles on the small, rocky island, nor does anyone there ride a bicycle due to the mountainous, cobbled streets and roads. The only modes of transportation on Hydra are walking, riding a donkey (of which there are over 500 on the island) or water taxis. For this reason, it rarely takes more than half an hour for visitors to Hydra to radically downshift and adjust to a slower and more peaceful rhythm of life. The DESTE exhibition space on Hydra is located near the sea, it is relatively small, and the huge coastal cliffs form an ideal backdrop for an undisturbed rereading of Plato’s dialogue. And if that’s not yet enough, the annual Athens Festival is taking place in full force in Athens all summer until August 30. One of the festival’s finest venues is the Great Theatre of Epidaurus. Built in the 3rd century BCE with seating for 14,000 people, it is one of the most beautiful theatres in the world and served as a venue for performances of the ancient Greek tragedies at a time when they were still being written. This year, the festival’s special guest is Italian experimental theatre director and poet Romeo Castellucci. For another current cultural event in Athens, see the Terrapolis art project at the French School at Athens (Didotou 6; www.neon.org.gr) until July 26. 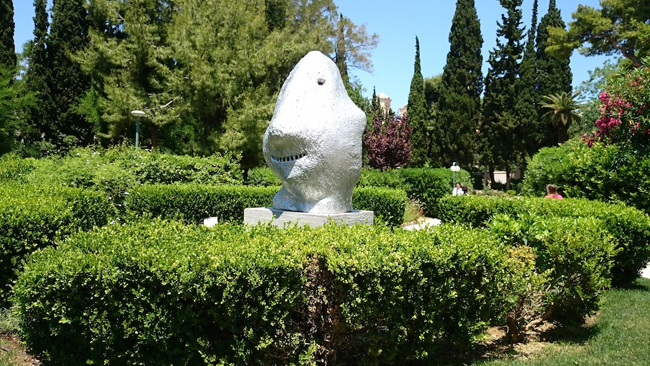 The school’s garden – a small, green oasis – holds more than 30 sculptures (created by, among others, Ugo Rondinone, Sarah Lucas and Yayoi Kusama) that symbolically remind the viewer of humankind’s link with nature and animals and the metamorphoses of the natural world dating back to the times of ancient mythology. In addition, this is also the first time that the school’s park has been opened to the public since the school’s construction in 1846. 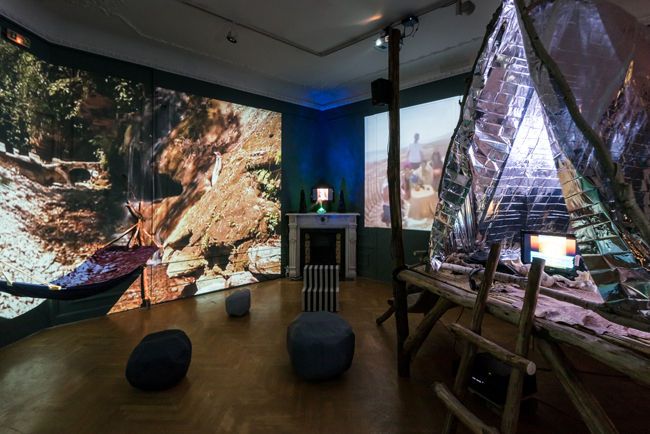 The Terrapolis exhibition is the result of a mutual project between the Greek contemporary art organisation NEON (from the Greek word for “new” and founded by another influential Greek art collector, Dimitris Daskalopoulos) and London’s Whitechapel Gallery.